I’m guessing if you’ve read Kathryn Stockett’s The Help, (or, I guess, seen the movie) there’s one scene in particular you’ll never forget: The Pie. THE pie. Ugh. I’m not gonna lie, our book club spent more time than any so-called sophisticated women would like to admit dissecting the intricacies of Minny’s infamous Chocolate Cream Pie. The taste. The texture. The aroma. We debated the…*ahem* techniques that rendered such a pie possible. (Wait…who am I kidding…obviously all sophistication went right out the window with this conversation.) If you’ve read the book, chances are, you’ve at least thought about this stuff too. In all seriousness, I’ll never look at a Chocolate Cream Pie quite the same way again. I follow the family recipe to the letter. The same my husband had used. My crust is always buttery and flaky. My sugar and melted chocolate is always creamy and smooth. Then the crap hits the fan. I pour the boiling chocolate slowly into a bowl of egg yolks while stirring rapidly. My result? Scrambled eggs. Every. Single. Time. Without fail. The first time this happened about seven years ago—my first attempt to tackle this beast—I thought it was normal. (Sophisticated, right?) So I poured the chunky chocolate slop into the pie shell, refrigerated and served. Now, I don’t know if you’ve ever eaten what can only be described as chocolate pudding fried rice quiche…but it’s not such a tasty combo. 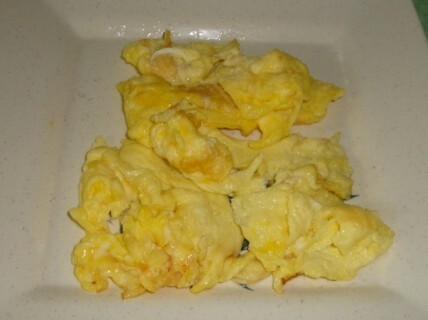 Then, a couple years ago on Christmas, another attempt, and again scrambled eggs. I thought I could salvage it by sifting the chocolate mixture through a colander, filtering out the egg chunks. In a desperate attempt to save this pie at all costs, most of the egg-free filling I shoveled into the pie-shell had actually been retrieved from the bottom of the sink where it had fallen during this messy process. (Yep…sophisticated and sanitary!) As it turns out though, the egg yolks actually do serve a purpose. This chocolate cream pie was more like chocolate soup pie. Another disgusting attempt. I’d like to ignore the fact that my husband has used this same family recipe successfully. I’d like to declare the chocolate cream pie a pie cursed. But unfortunately, I’m a realist: I’m defective. So, here’s the recipe. May it bring you more than it’s brought me: a wealth of bitterness and self-doubt. Clearly, this pie was not made by me. 2 ounces unsweetened baking chocolate, cut up. Separate egg yolks and beat slightly. Set aside. Mix sugar, cornstarch, and salt in a sauce pan. Slowly stir in milk, then add cut up baking chocolate. Cook over medium heat, and stir constantly, until chocolate melts and milk thickens. Allow the mixture to boil, be sure to stir the entire time so milk does not burn. Boil and stir one minute. Stir the warm (hopefully not scrambled) yolk mixture back into the pan. Boil and stir for one minute. Remove from heat and stir in softened butter and vanilla. Pour into pie crust, and refrigerate for at least two hours. 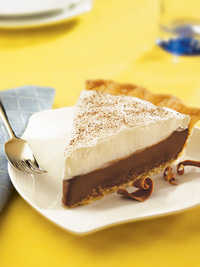 This entry was posted in Desserts, Holiday dishes, Pies, summer desserts, The Help and tagged Chocolate cream pie, chocolate cream pie recipe, chocolate creme pie, chocolate creme pie recipe, how to make chocolate cream pie, how to make chocolate creme pie, learn to make chocolate cream pie. Bookmark the permalink. Wow, scrambled eggs?!?! Really? That’s gross! Maybe Brian should be in charge of the pies instead of you. Stick to your Mac N’ Cheese and cheese enchiladas! But don’t even start with the smack talk! When was the last time you made a chocolate cream pie? Seriously, try it. If your eggs don’t scramble then, fine. Much respect. Until that day. Shutty. I am really feeling the need to try making this to see if my eggs scramble! I am actually on a long hold list for this book at the library and now I am very intrigued by “the pie”! Hi there, I know this is from a while ago, I stumbled across it because I was referencing “The Pie” and I couldn’t for the life of me remember Minny’s name (thanks for that by the way) so the great gods of Google brought me to you. I used to have a lot of trouble tempering eggs too. The trick is where the recipe says “Pour a little of the hot mixture into the egg yolks” they’re vague. There should be more emphasis on a LITTLE at a time. Think maybe a teaspoon at a time. Also the quicker its incorporated the better, so if you’re clumsy like me a food processor works absolute wonders. Just pop your egg yolks in there, pulse and set aside then when you’re hot mixture is ready, turn the machine back on, add a teaspoon, wait a few seconds while it incorporates it, add another, wait a bit, rinse repeat. I really want to try to make this pie. I too will pry end up scrambled eggs. If it does turn out, I mawy have a hard time enjoying it because of The Help.